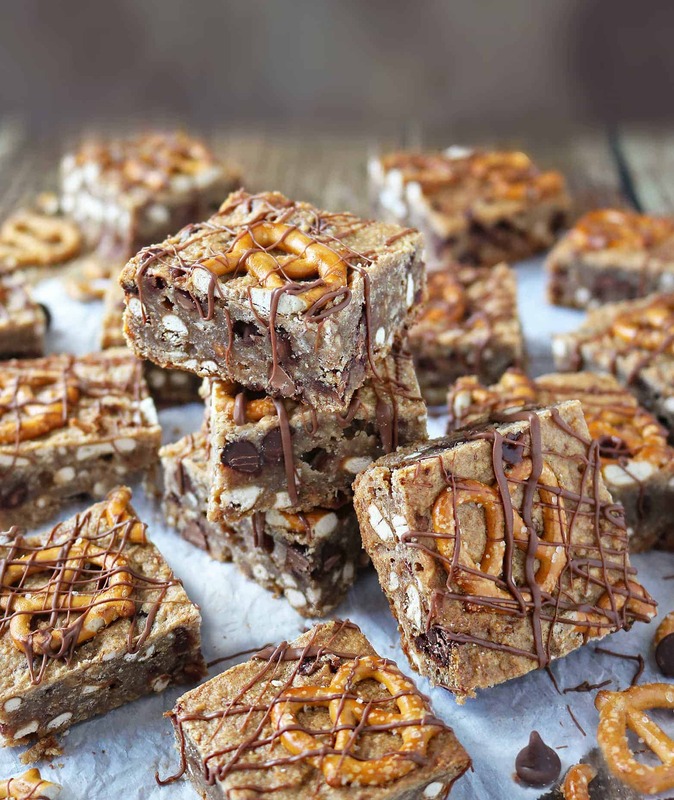 I like to think that these, 8-ingredient, blender-made, Chocolate Pretzel Bars are “healthy” as they are sweetened with dates and contain coconut oil instead of butter – and are ridiculously easy to whip up! Between you and me, how far have you gone for your favorite food? Well, between you and me, I lurrve cake. So, when my friend and fellow blogger, Allie (from Through Her Looking Glass), mentioned how wonderful the chocolate cake at Brick Street Cafe was, well, there was only one thing to do. And…that was to take a road trip to taste and see for myself! I managed to talk my daughter into joining me on a drive up to Greenville, South Carolina, to enjoy some of that Brick Street Chocolate Cake! And, y’all, that chocolate cake didn’t disappoint! It was good! Great, even! But, so was the coconut cake, the sweet potato cake and the german chocolate cake. Yes, we had cake for lunch AND for dessert. We hadn’t packed anything else to munch on so figured why not! After getting totally caked, the thought of jumping back in our car and sitting still for 2+ hours on the drive back was almost unbearable. Besides, I knew that when that sugar high wore off, I’d be super sleepy! And, for some weird reason, when I get sleepy when I’m driving, I need to guzzle water. Loading up on h20 somehow manages to keep me awake. But, as luck may have it (total sarcasm here) we hadn’t packed any water to bring along! But, live and learn – right? 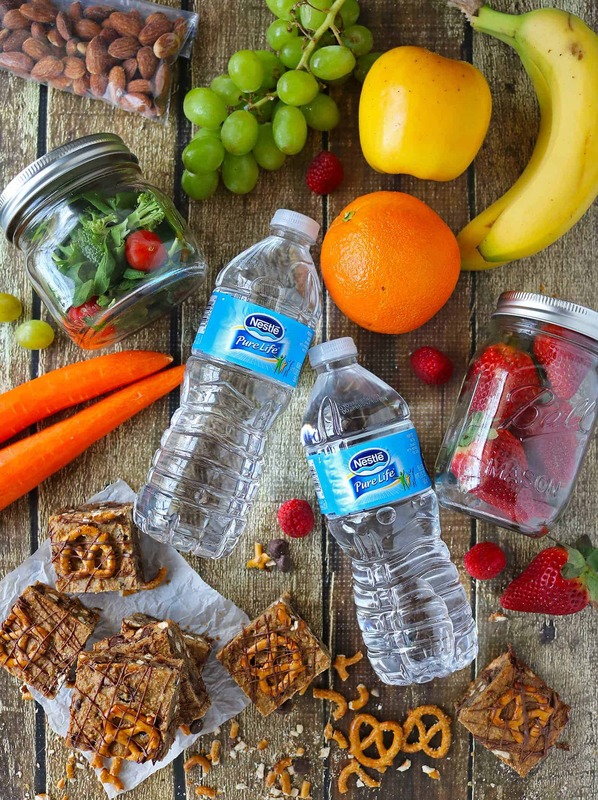 Well, now whenever we decide to take a road trip, we make sure we are armed with a 40 count pack of Nestlé® Pure Life® Water along with 9 other travel essentials! Nestlé Pure Life is committed to delivering pure, great-tasting water to you and your family. Every drop in every bottle of Nestlé Pure Life is filtered through a 12-step quality process. To ensure great taste, Nestlé enhances their water with a unique blend of minerals. 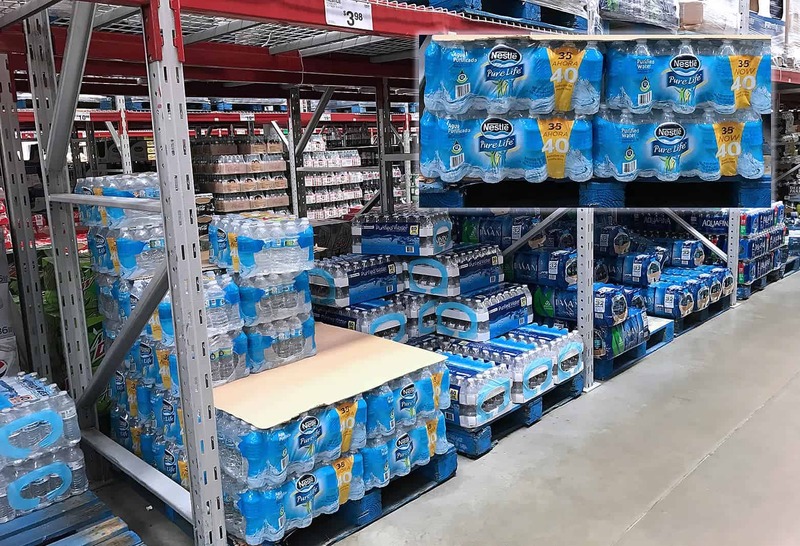 40 count packs of Nestlé Pure Life are now available in select Sam’s Club stores (for the same price as the 35 count packs), ask your Club Manager about getting Nestlé Pure Life Water in your store if it’s unavailable. 4) Nuts – out favorite is almonds! 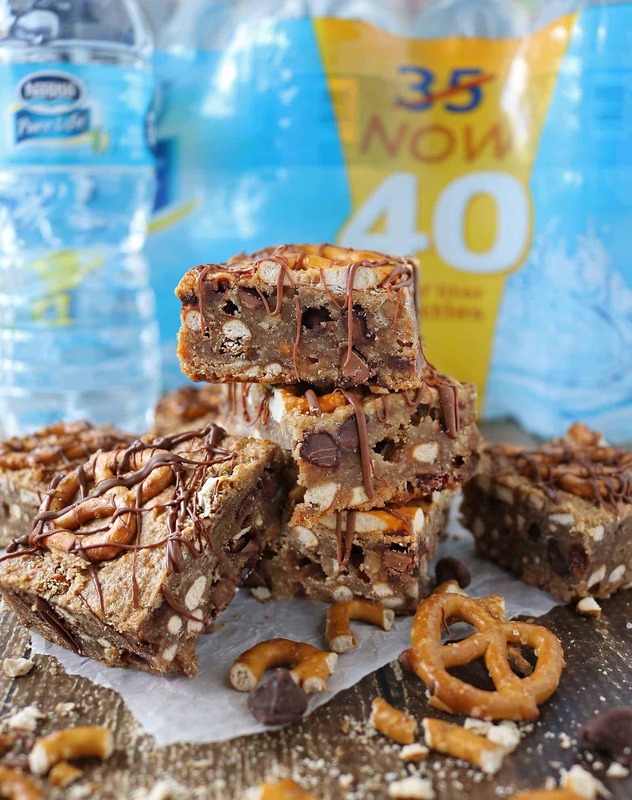 10) A healthy treat – like these sweet and salty, Chocolate Pretzel Bars! 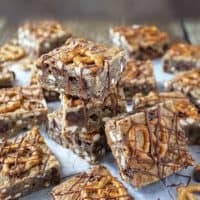 I made two batches of these Chocolate Pretzel Bars. I sweetened one batch with medjool dates and employed coconut oil in it in-place of butter. So, other than the chocolate chips, this first batch was refined sugar free. I made another batch with brown sugar instead of dates and half butter and half coconut oil. I didn’t get to taste the second batch as I took it to my daughter’s school and ended up bringing home an empty tray – so, I guess it’s safe to say my daughter’s classmates enjoyed them. I can attest to the fact that that first batch was so ridiculously good – and easy to make! If you have some oats, eggs, coconut oil, dates, chocolate chips, and pretzels in your pantry, y’all can easily whip up a batch of these with the help of your blender and oven! Slightly crunchy and less crumbly than the second batch – this second batch id not only wonderful road trip food, but are just as delightful with a cup of tea or coffee for breakfast or dessert. So, how far have you gone for your favorite food? How do you stay awake during a long drive? Would you like to find out more about Nestlé® Pure Life®? Then make sure to follow them on Facebook and Instagram! Add the softened dates, coconut oil, eggs, salt and vanilla to the blender and pulse till well incorporated. Pour mix into parchment lined baking tray and bake for 35-37 minutes. Let cool and, if so desired, melt 2 ounces of good quality chocolate and drizzle on top and enjoy! Refined sugar free and good fat…wonderful! Love all of these road trip ideas….and these bars, oh my word! They look so delicious! 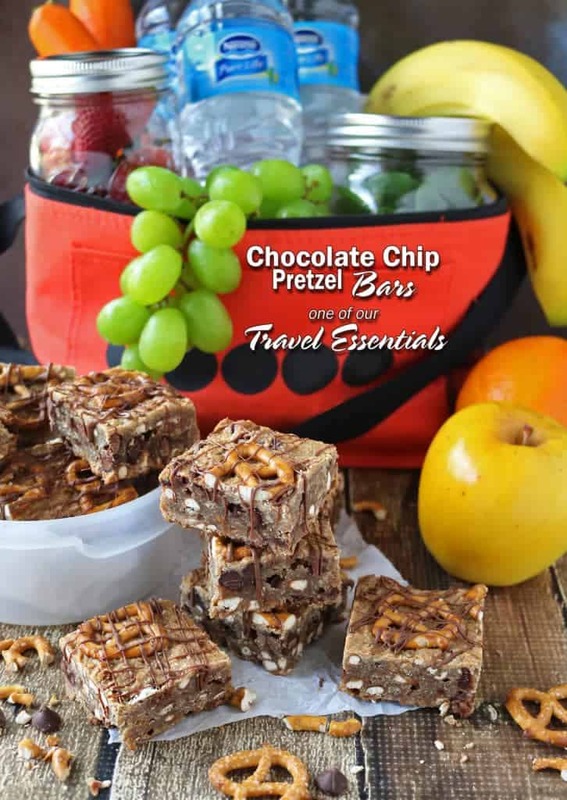 I’m always looking for new travel snacks and these look perfect. Thank you for sharing. Wow it is so hard to believe that these are actually “healthy”. They sound divine…and totally addictive for sure. I love using my blender too. Makes things easier and faster in the kitchen. these bars look absolutely amazing, but I also LOVE your packing tipss! 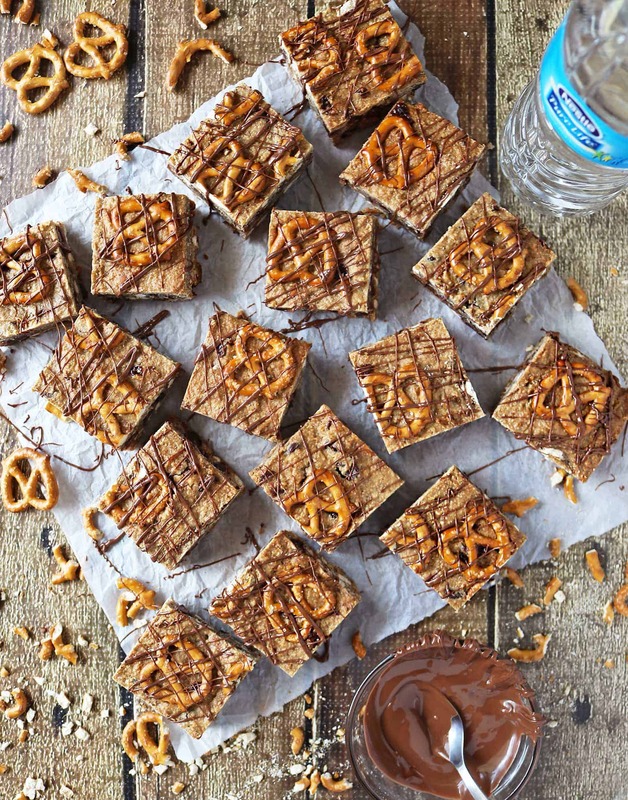 Salty pretzels marry perfectly with chocolate, don’t they? Love that flavor combo! These look great — thanks. ohhhhhhh my goodness! Chocolate covered pretzels are one of my favorite desserts ever and these look INCREDIBLE! Just pinned to make soon! These look so ahhmazing and totally addicting! Wishing I could reach through this screen and grab a couple! Yum! I’m addicted to Pretzels Shash. That’s one snack that I Lynne knows if she buys a packet I’ll be finishing it within the hour! 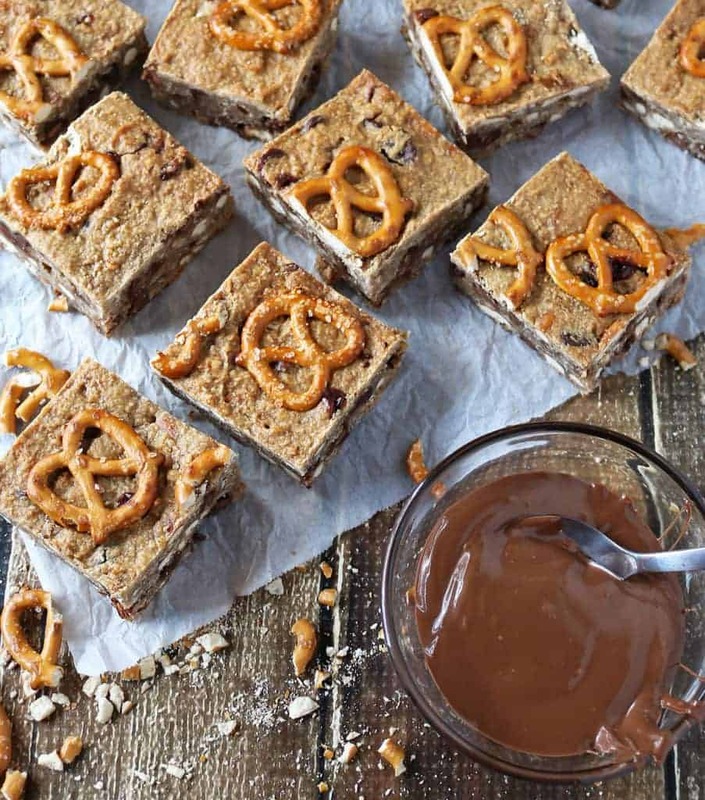 But I think baking these delicious and healthy chocolate pretzel bars could mean I would eat less of the Pretzels, as they would be needed for this recipe! Haha, your “getting totally caked” made me laugh, Shashi! This should be in all idiomatic dictionaries:) We’re not that easy-going to travel just looking for a specific food, but when we’re planning a trip, we always check what kind of local deliciousness this place is famous for. And you’re totally right about these snacks when it comes to a trip – we always have some fruit or nuts. I don’t know why, but road trips make us crave for something dangerously unhealthy like donuts (And it’s normally not one or two donuts – it’s a packed box!). That’s why it’s a good idea to have some homemade stuff like these bars. Made with oats and figs, there’s my huge YES! Perfect treats!